On Second Scoop: Ice Cream Reviews: When is it too cold for ice cream? When is it too cold for ice cream? I ask you, does this make you not want ice cream? 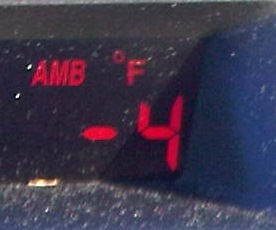 I've been in the car when it's cold before, but this morning easily takes the cake. The fun part was watching the final countdown from 32 to -4 as I drove down the street. Will this actually stop me from buying ice cream tonight? Ofcourse not!! It just means I'll load the car all that much quicker... before my fingers fall off. I don't know about you, but my fingers are necessary for the whole scooping of ice cream thing. Hmmmm, gotta pick some good stuff tonight! i second those who've already commented. true ice cream lovers are never deterred by such things as cold weather, calorie count, or bullet wounds. craving ice cream in cold weather is what separates the men (and ladies) from the boys (and girls).